Do you know that some of your daily habits can damage your brain? There are some habits that many of us practice which damages the brain tissue or cells. The human brain is like the CPU that helps one think, carry out the daily tasks and also takes care of all the organs. A damaged brain can lead to a number of health complications in one's body. • Skipping breakfast or no breakfast at all: People who do not eat breakfast have lower sugar levels which lead to inadequate supply of nutrients to the brain causing brain degeneration. 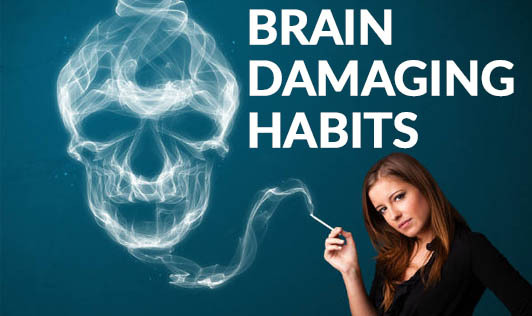 • Smoking: Smoking not only harms the lungs, but it also harms the brain as well. The nicotine in cigarettes contains substances that can cause multiple brain cell shrinkage, leading to Alzheimer's disease. • Lack of stimulating thoughts: Lack of brain stimulation can cause brain shrinkage. Thinking is the best way to train the brain, so think more, write more, and explore more. This will help you to keep your brain unsullied. • Sleep deprivation: Sleep allows the brain to rest. Long term sleep deprivation will accelerate the death of brain cells. More cells dead equals to more memory loss. • High consumption of sugar: Too much sugar consumption will only interrupt the absorption of proteins and nutrients causing malnutrition and may interfere with brain development. • Lack of interaction: Intellectual conversations will promote the efficiency of the brain. • Head covered while sleeping: Sleeping with your head covered increases the concentration of carbon dioxide and also decreases concentration of oxygen that may lead to brain damaging effects. • Working your brain during illness: Working or studying hard when you're sick may lead to a decrease in the effectiveness of the brain. • Overreacting: This causes hardening of the brain arteries, leading to a decrease in mental power. • Air pollution: Inhaling polluted air decreases supply of oxygen to the brain, bringing about a decrease in brain efficiency. Be watchful and try to avoid such situations!